Originally started by Randy Rose as a side project to the synthpop band Mad at the World. Rose played chriatian oldschool traditional doom with similarities to Trouble, Black Sabbath and Danzig. The two last albums have the most retro sound, but the rocking riffage was always present. 'Sacrificium' was released as a solo album in the artists full name: Randy Rose. 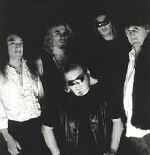 The two years that passed until the next release saw the project turn into the full-lineup band called Rose. Randy has also had other projects like The Crocodiles, Mood Ring, Saturn Project and Mothership.